Today I want to show you how to create auto-responders for your Facebook posts. 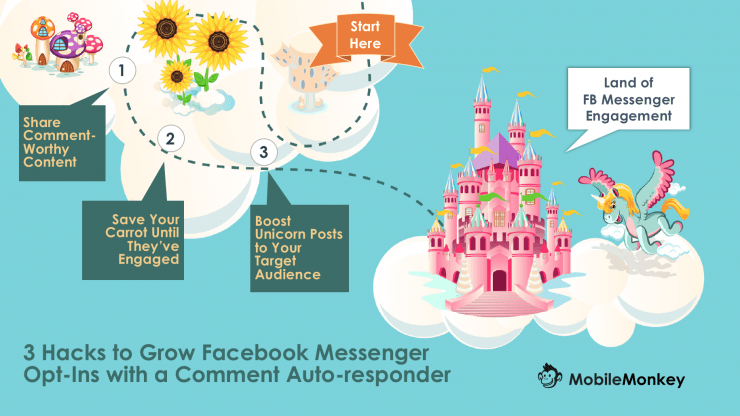 What’s so exciting about Facebook post comment auto-responders? Just everything. When someone comments on your post, you can chat them directly through Facebook Messenger. Here are a few chatbot templates. And you can add them to your Messenger opt-in list so you can message them more. Using post comment auto-responders is a Facebook Messenger hack that grows your Messenger opt-in list. This matters because engagement in chat is outperforming email, social and search. Engagement is the huge but often overlooked opportunity at the heart of digital marketing. Engagement is email open rates. Engagement is comments, likes and shares on social. And engagement is clicks to our site from search. The average email open rate is in the 10-15% range. The top search ad might get 7% of clicks. Maybe 1% of Facebook followers see Page content in the News Feed. Talk about a load of donkeys. It’s not all bad news. 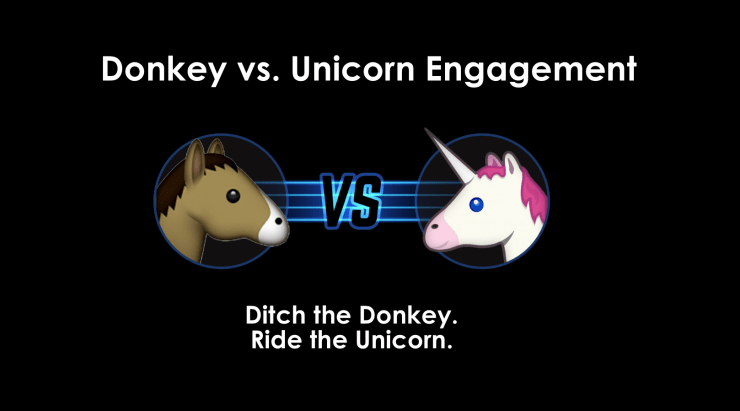 There’s some largely uncharted unicorn territory that’s seeing 70-80% engagement. Crazy, right?! 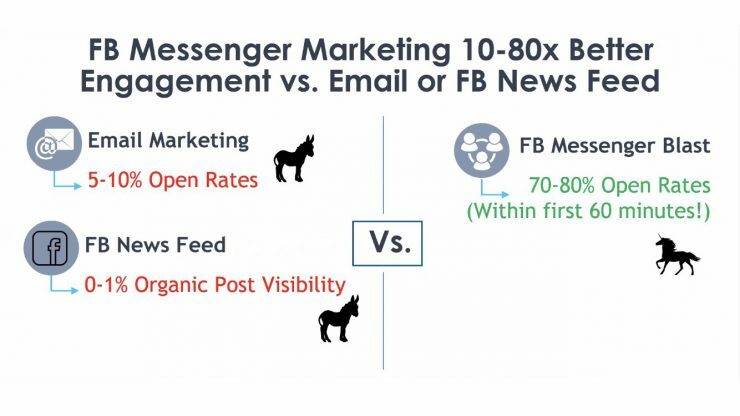 It’s Facebook Messenger Marketing and it gets 10-80x better engagement than email and the Facebook News Feed. Businesses are using Messenger to reach subscribers with chat blasts, schedule appointments, process orders, send reminders and do customer service. 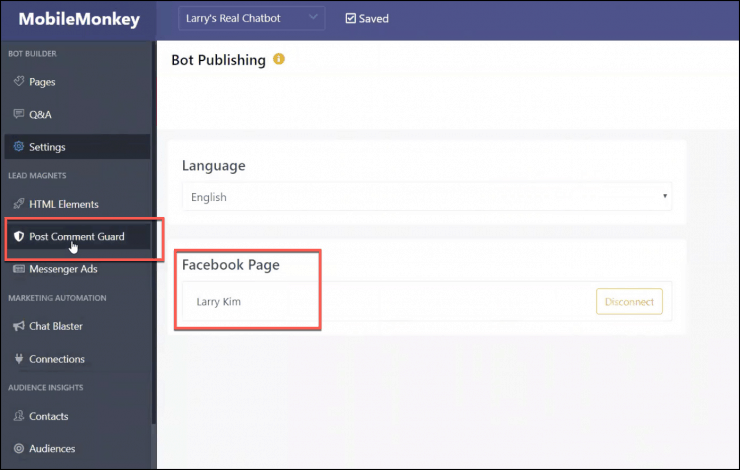 Today I’m going to show you three easy hacks to grow your Messenger subscription base with an auto-responder chatbot called a Comment Guard. To get started with this Facebook Messenger lead magnet, check out how easy it is to add a Comment Guard to your Facebook post. 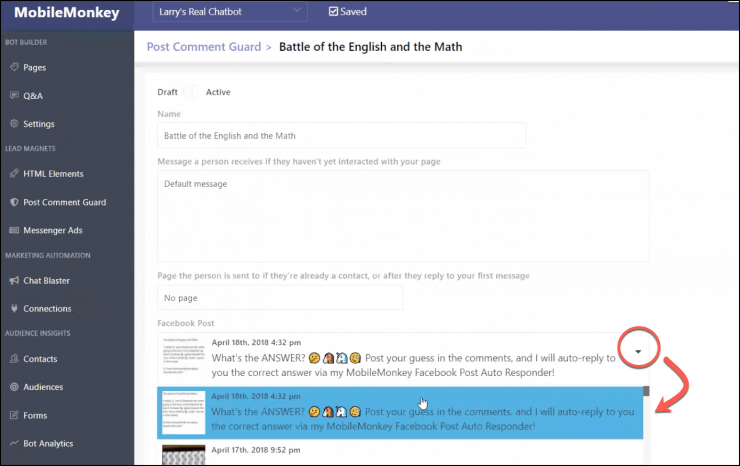 Go to “FB Comment Guard” under Lead Magnets and create a new Comment Guard. Give your Comment Guard a helpfully descriptive name and add the text a new contact will see when they comment on your post. Pick the Facebook Messenger chat page a user will go to from there to essentially funnel them through your selected content experience. We’ve got a quick and simple MobileMonkey Comment Guard video tutorial if you want to see how it’s done live. And just like that you’ve set up a Facebook Messenger contact list growth marketing hack! 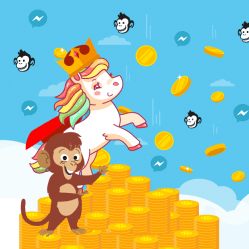 With your MobileMonkey Comment Guard up and running, use my top 3 hacks for getting loads more opt-ins for your effort. Hack 1: Share comment-worthy content. Step 1 is sharing content that provokes comments. Here’s an example. 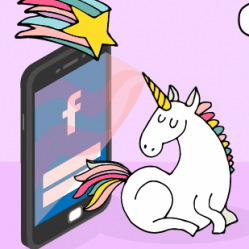 This tweet got over 400 comments so I knew it was a unicorn with a shot at getting a bunch of comments on Facebook. So I made a Facebook post with the same riddle and asked people to guess in the comments. With the comment-worthy content in place on Facebook, create the auto-responder that sends them the answer. Go to MobileMonkey and under Lead Magnets, create a new Post Comment Guard. Hack 2: Get them to engage with the bot before you give them the answer. For people who have never interacted with you in Messenger, send them an auto-responder asking a question they’re likely to reply to. It doesn’t really matter what you ask. The goal here is to get them to engage. Once someone messages you in Messenger, they’re opted in to your list. Would you like to know the answer to the English vs. Math? Type YES for the explanation! Now select the Facebook post to hook up to the auto-responder and then create the landing page. Use an image and text for the answer. Once you’ve got them engaged a little bit, follow-up with a quick question. You can create different experiences for people depending on their answer. Go ahead and test it out on my post to see how the comment autoresponder works. Hack 3: If it’s working, boost the post to your target audience to get a ton more responses and sign-ups. You know how I like to blast-off unicorns into space with a paid boost. 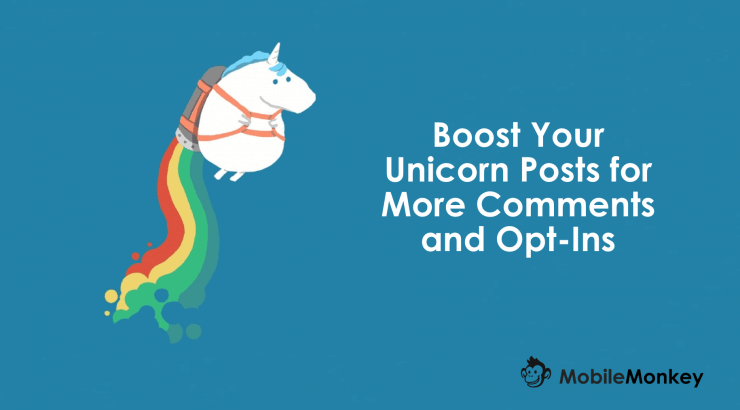 If a post with Comment Guard is working, shoot that unicorn to the moon to keep your list growing. 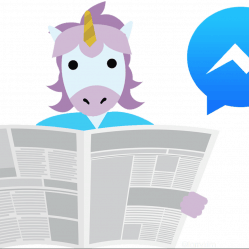 With these three unicorn growth hacks you can increase your Facebook Messenger subscriptions. The value is that when someone engages with your lead magnet, they’re opting in to messaging with you. And now you have a direct line to interact with your customers on a channel that sees up to 80% open rates. 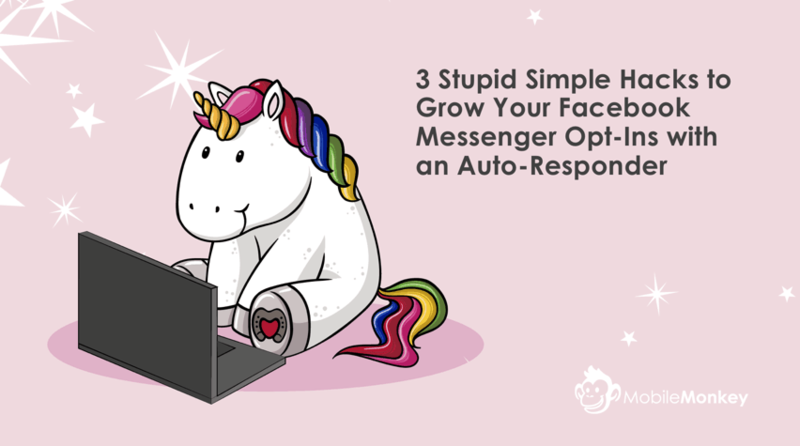 See why you’d want to build your Facebook Messenger opt-in list? 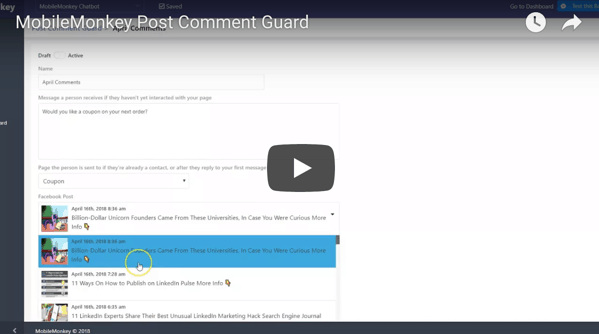 Check out the Comment Guard we just built in action here. 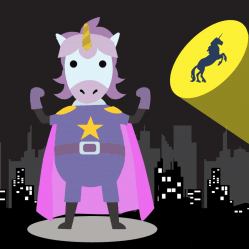 Get my very best unicorn marketing and entrepreneurship growth hacks. Sign up to get tips sent to your email. And sign up for occasional updates on Facebook Messenger Marketing sent to you in Facebook chat. Now I will also use auto-responders for my Facebook.